I’m not sure what possessed me to buy four squashes on my way to school. They were on sale, I guess. Well, actually, I do know. They were on sale. But all that fades to the background when you’ve been dragging a bag of squash around school for four or five hours. You walk into class all cool and nonchalant with your huge grocery bag cutting off the circulation to your arm and try to stash it under the table with your umbrella and messenger bag and a stack of books. Then you forget about it all until you have to load yourself back up again and wander down the street to a salon about innovation models in cultural policy with Stuart Cunningham. There you’ll repeat the ridiculous ritual of stashing your bag of squash under a seat while trying not to attract too much attention. Topics included broadening the definition of innovation beyond the Frascati definition. the role of universities as incubators, the disconnect between culture and policy, the impact of new technologies on innovation, hidden innovation and the reasons why it’s not addressed by policy. ‘Twas interesting. When you drag a bag full of squashes on to the Skytrain during rush hour you suddenly become that person that everyone hates as they have to try and squeeze past you. But now that I’ve dragged my squashes home and made some dinner (not squash-related) I’m not feeling like really doing anything. 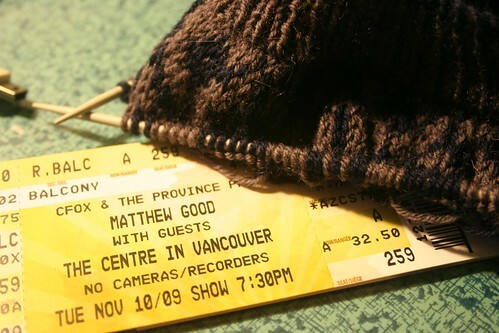 I think I’m going to just knit and veg and figure out how I’m getting to this concert. That and figure out what to do with the squashes. This entry was posted on Tuesday, November 10th, 2009 at 1:13 am and is filed under Uncategorized. You can follow any responses to this entry through the RSS 2.0 feed. You can leave a response, or trackback from your own site.